Last night we had Christmas with my side of the family. We always just have appetizers & desserts...sooo good! I brought Peanut Butter Blossoms (yum!) 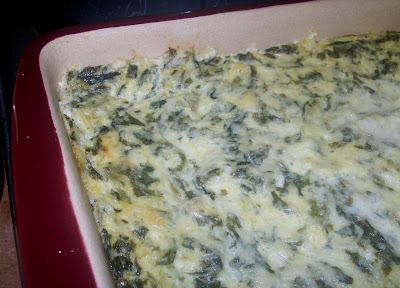 but i was also asked to bring Spinach Artichoke Dip... something I'd never made it before. I requested a good recipe via facebook & immediately had lots of replies! I ended up using my sweet friend Robyn's...only I had to substitute one ingredient because i had already done the grocery shopping. It turned out AMAZING. Was a huge hit. Beware...it is NOT healthy...despite the spinach & artichokes. :) i would say this is a once or twice a year kind of dish! HA! But it is a GREAT recipe to use for parties & such. 1. Saute onion & garlic in butter. 2. Pre-cook spinach; drain well. 3. Add spinach to onion & garlic. 4. Add cream cheese, sour cream & artichoke hearts & cook over medium heat. 5. Add cheeses & red pepper. Serve with tostidos or crackers. Robyn said that leftovers are excellent in an omelet the next morning!! We have no leftovers or we would try that! Haha. Sounds amazing! Will definitely be making this one again. This sounds yummy and I just copied it into a new document to print and try...thanks!